Bio Clean, Inc. is a certified Decontamination Cleanup Contractor. What does that mean? It means that we’ve received the training and passed the tests that demonstrate our understanding of the procedures that must be followed to decontaminate a space, structure, property, or person. It means that we’re the people you want when the worst happens. Not only will we will respond compassionately, but also competently. Decontamination and cleanup methods depend upon the level and extent of contamination. Some methods are ineffective or very expensive if the property is heavily contaminated. Typically, decontamination and cleanup involves cleaning or washing, removing or gutting, or a combination of thereof. Often the washing of surfaces, even beyond the “triple-wash/triple-rinse” standard, must be repeated to be effective. Experience has taught us that tearing out a structure’s interior and rebuilding it is often more cost-effective than repeatedly washing, depending on the level and extent of the contamination as well as the base materials (raw wood verses painted wood, porous surfaces verses non-porous surfaces, condition of the drywall, etc.). Also, the very nature of washing verses gutting-and-replacing-with-new-materials lends the gutting process to be the most effective method of completely eliminating contamination. Cleanups can be very expensive. There have been instances where the property had a low value and was too heavily contaminated or difficult to clean. So it may be more cost-effective to demolish a structure in these instances. While this is rare, it is an option to consider for some. Even with demolition, contaminated materials must be disposed of properly. The EPA’s Voluntary Guidelines for Methamphetamine Laboratory Cleanup is a reference you may wish to read to understand some of the details and intricacies of methamphetamine decontamination and cleanup. Keep in mind this EPA document is not meant to supersede municipal, county, or state guidance documents, regulations or statutes. 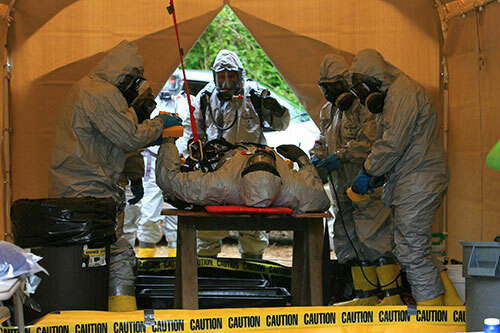 For instance, in the State of Washington, most local health jurisdictions have their own set of regulations and guidance documents that set forth how decontamination projects need to be done.